Linda Formichelli provides breakthrough creativity for high-profile brands. Since 1997, she's written eyeball-grabbing content for Redbook, Edelman, CVS, TripAdvisor, Cleveland Clinic, and more. Linda's also the cofounder of Renegade Writer Press, which publishes books like Commit: How to Blast Through Problems & Reach Your Goals Through Massive Action and The Renegade Writer: A Totally Unconventional Guide to Freelance Writing Success. Follow Renegade Writer Press on Twitter @renwripress. Have you been attracted to headlines like these? Of course you have, and I understand why: For us content marketers, eyeballs are everything. The more people we have reading, listening to, and watching our content, the better. But what if the best way to grow a loyal audience for your content is to let your subscribers go, or even to shove them out the door? 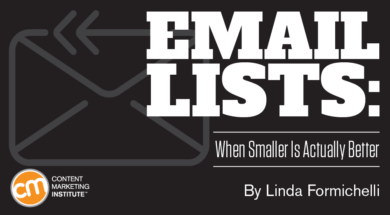 I learned the hard way that bigger isn’t always better when it comes to email lists. Now, I want to share how to pare your list to make it more effective for your business – and your target audience.